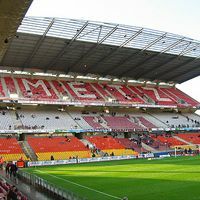 This wasn’t a game decisive for the promotion – Metz were quite sure of keeping their 2nd spot and being promoted, anyway. It wasn’t a special rival, either. Cherbourg are well in the relegation zone and come from the opposite side of France, so no local derby as well. And yet exactly 18,545 people came to yesterday’s fixture of the two teams at Stade St Symphorien, beating the former record by mere 15 people (18,530 from Nimes). This is still well above average crowds in top divisions of most premier leagues of the world. World record seems beyond reach, though. In Europe first spot is reserved to Cardiff City and dates back to 1947, when the club fought Bristol City at Ninian Park in front of 51,621 people. Globally the record is in Salvador, Brazil, where in 2007 promotion game of SC Bahia was seen by 59,917 spectators. Sadly, that day saw the last game at Estadio Fonte Nova, too, after 7 people were killed in a concrete step collapse.